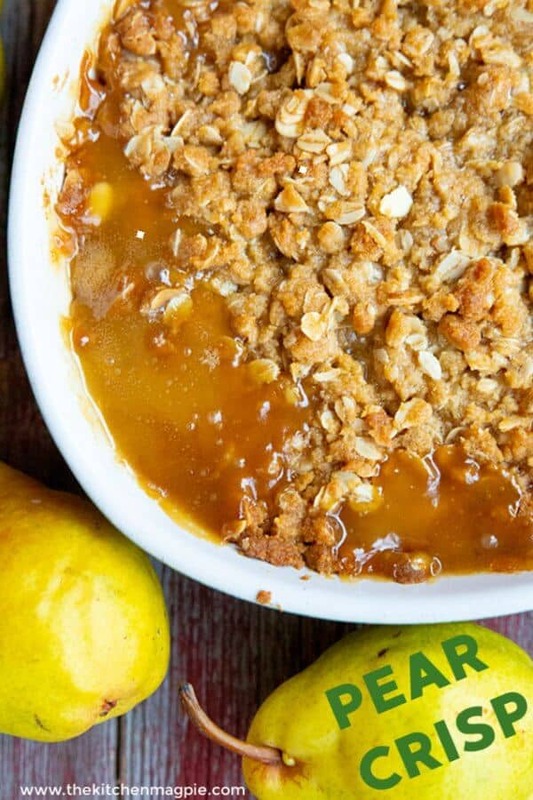 This Pear Crisp Recipe is perfect for when you have a large amount of pears to use up. 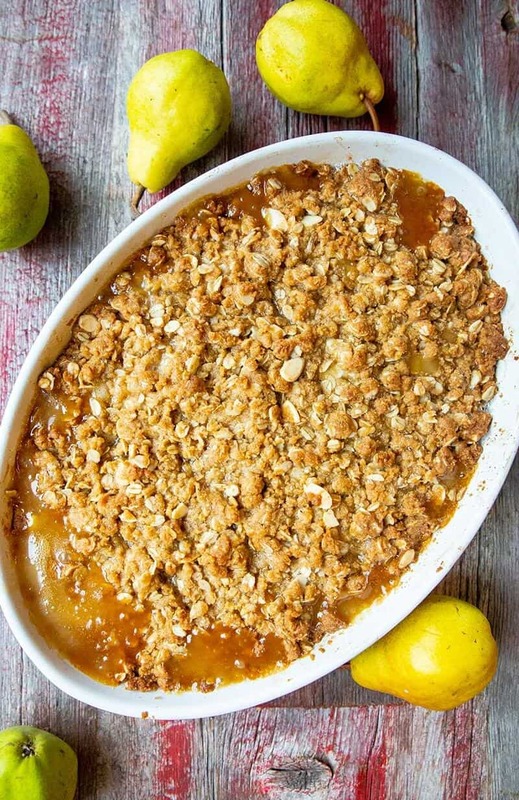 That usually happens when I buy pears by the bag, there are always some that ripen too fast for us to eat and keep up with, so I throw them into a pear crisp! This fall dessert is perfect served with a dab of vanilla ice cream on top. 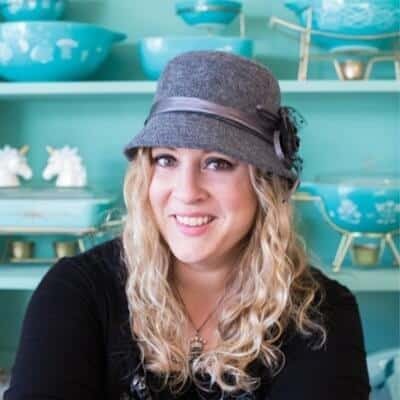 Fall is here and while we all think of pumpkin first thing when it comes to fall recipes ( I am totally guilty of this) I also love the very often overlooked pear in the fall months. I bet if they had made a pear spice latte that things would be different, but alas, the lovely pear is ALWAYS the last thing that people think of. Apples in the fall? Of course. Pumpkin? Without a shadow of a doubt. Pears? Poor pears. Not so much. 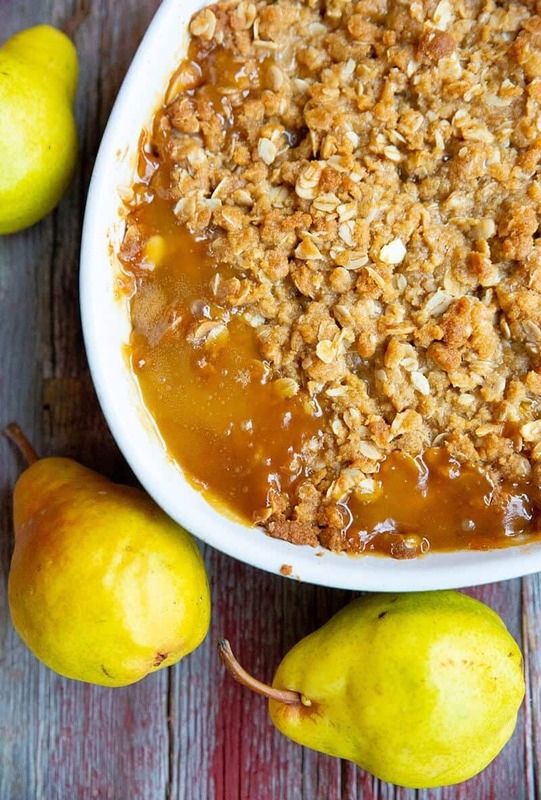 I love a good fruit crisp that uses brown sugar and as you can see, this pear crisp has THE most decadent caramel sauce as a result. You can adjust the brown sugar to taste if desired, if you are wanting a sweeter crisp. The amount in my recipe was perfect for us. Pears right now are going to be the best tasting, the cheapest and the most abundant they are ever going to be this year. If I had time I would can some pears as canned pears are the bomb when it comes to canned fruit. Alas, I’m barely hanging in here as it is when it comes to time, so canning is off the fall menu this year. Now, I have doubled the recipe below and put it into a larger pan, so that’s why you see the larger pan when the recipe calls for an 8×8. I figured that no one needs to always make a big 9×13 pan of pear crisp, so you have both options. Happy baking, my fellow pear lovers! Pre-heat your oven to 400°F. Butter a 8x8 baking pan and set aside. Combine all of the pear filling ingredients together. Place in the prepared baking dish. Combine the oatmeal, brown sugar, flour and allspice. Sprinkle the crumb mixture over the pear filling. Bake 25 to 30 minutes, until topping is crisped and brown. Remove and serve warm, with whipped cream or vanilla ice cream if desired.